I don’t even want to think about this sort of thing, but Kat over at Just Crafty Enough reminds us that there are 24 weeks until Christmas. With that in mind she’s starting her advent calendar project, which will include one little project a week for the next 24 weeks that can be used on the tree, to decorate gifts or otherwise to make things merry around your home. 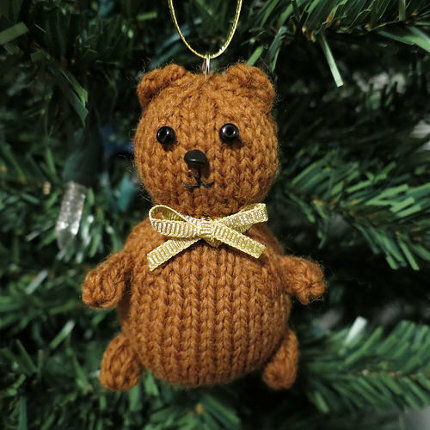 First up is a little knit bear that’s perfect for hanging on the tree. You just need a little bit of yarn to make its peanut shaped body, so work it in brown, black or white for an authentic bear look, or use little bits of your stash on this project. Or knit a bunch in a bunch of different colors and give them as part of the gift this year. Thanks Sarah for showing off my little bear! By the way, it’s only 24 weeks until December 1st if that makes you feel any better…. Well, no, not really 🙂 but thanks for correcting my math! somebody finally gets what how far in advance holiday knitting projects need to be for me!